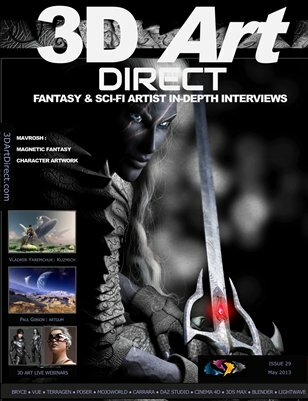 3D Digital Arts magazine with a focus on the sci-fi and fantasy genres. We discover the stories of the artists and the creation of their art. "Extraordinary Fantasy Character Artwork with Incredible Texturing using Daz Studio 4.5 Pro"
- Vladimir K Yaremchuk – (KuzMich) on Bryce and Vue. - Paul Gibson creating with Bryce Vue, Terragen and 3DS Max from his 3D toolbox. - Mavrosh Stratiotis is a Daz Studio 3D artist from Germany with a real eye for fantasy character art. She resides in Münster where she works in Media Design and Illustration.